Happy Easter Sunday and, especially for Mrs Beez, 'a pinch and a punch for the first of the month'. 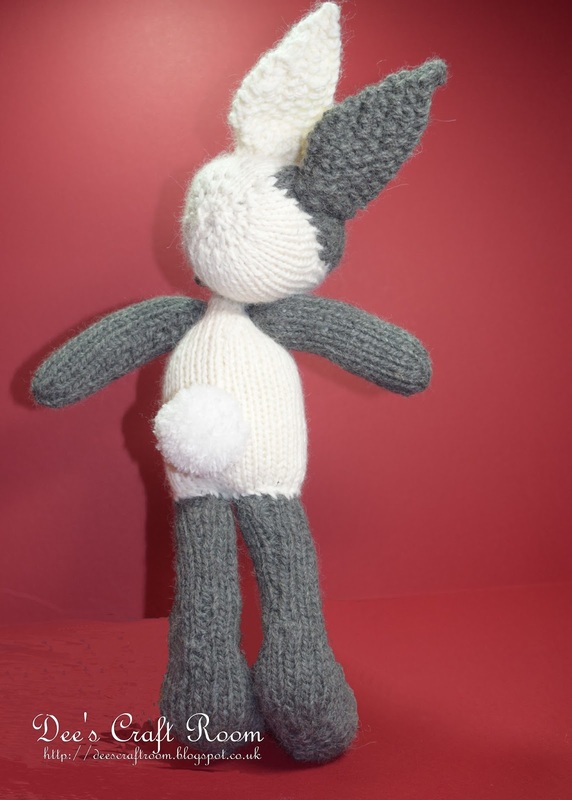 Today I should like to share my cuddly big bunny with you. 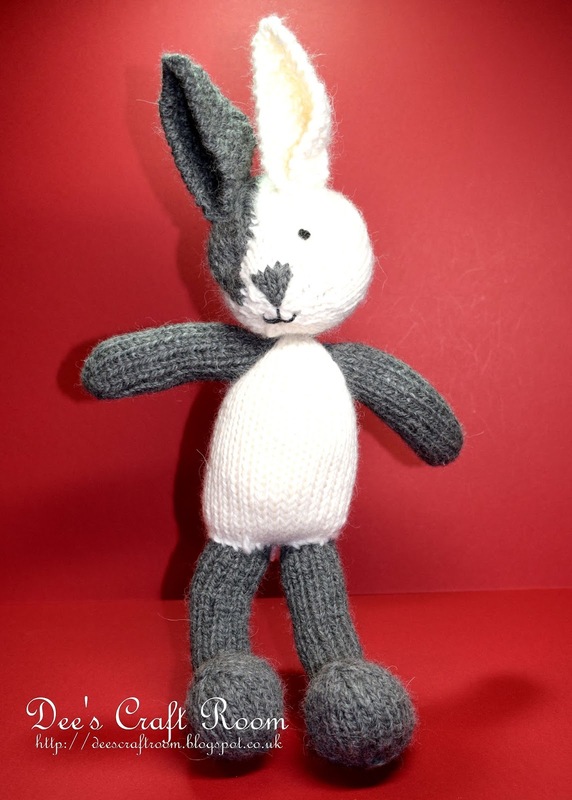 He may look a little familiar to you, that is because I included a couple of photo of this bunny in my post entitled 'Mendel's Bunnies', where I tried to show you the different sizes I could get from knitting one of Julie Williams 'Little Cotton Rabbits' patterns in different thicknesses of yarn but I saved blogging about him for today - it seemed appropriate being Easter and all that. 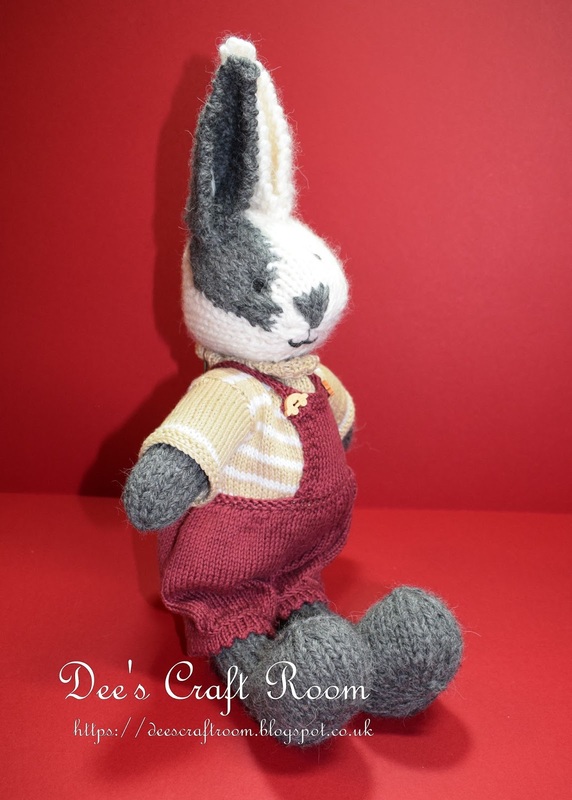 This adorable little boy is made in Chunky Knit. 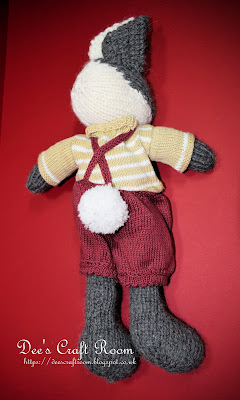 The patches on his head are all part of the pattern and I love knitting the nose instead of stitching it on afterwards - I am not very good at stitched noses. His eyes are made with French Knots and the mouth is stitched on at the same time as you make the eyes. Here is the naked shot, I know how much you enjoy the 'Full Monty' view. He is very photogenic and I think he knows it all too well! Te he. Oh, not forgetting the back view and his fabulous fluffy tail. I just adore how his tail pops through his trousers (I suppose it would be very uncomfortable to have a great big powder puff in your underpants). 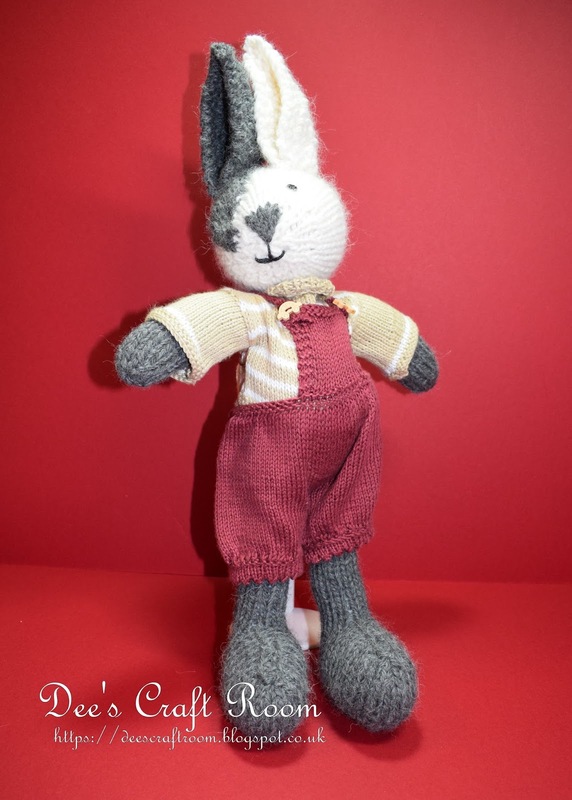 Because this bunny is so much larger than the normal Little Cotton Rabbit, the clothes designed for those rabbits would not fit him. 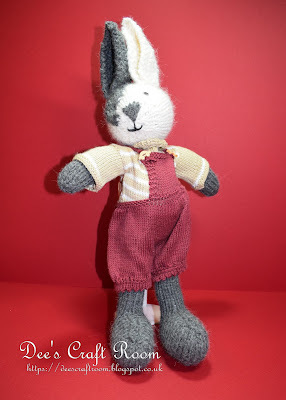 Instead I made him a set of clothes using a Mary Jane's Tearoom pattern. 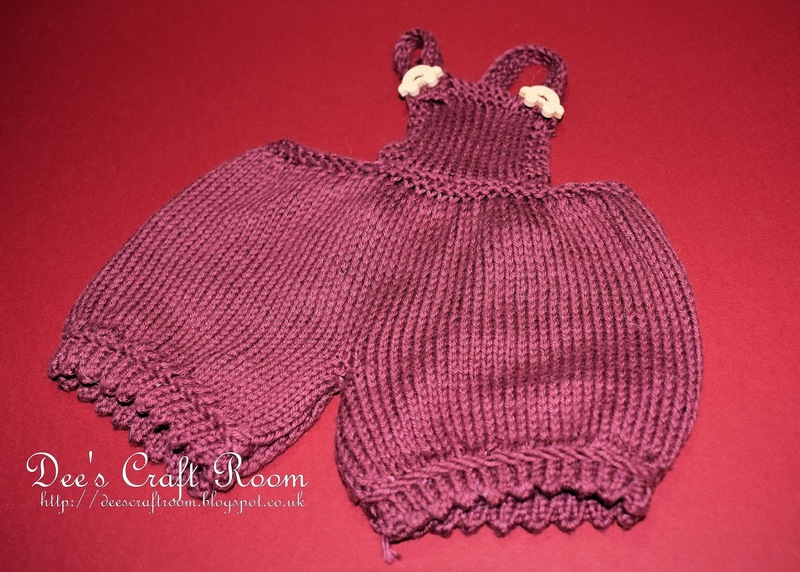 The picot edged dungarees are made of 4 ply cotton, it has very small car shaped wooden buttons. I added a decorative stripe to the fawn coloured jumper. It is fastened with small buttons on the back shoulder seam. I hope you enjoy the rest of your Easter Holiday. 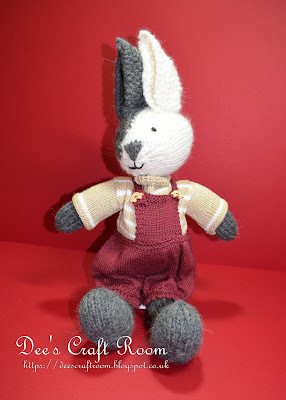 Adorable bunny! Gosh, such an amazing job you have done. 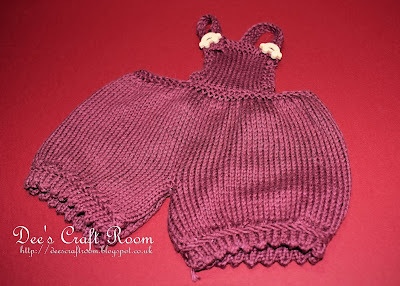 The jumper is adorable and that's such a great color too. Hi, so nice to hear from you, I hope you and the family are doing well. Easter was very wet here (or very snowy, depending on which part of the country you live it). But it was lovely to relax and spend time with the family. Thank you for your lovely comments on my Big Bunny. 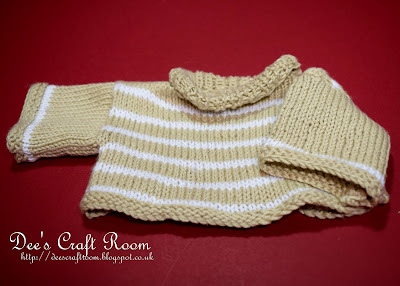 Making things in chunky knit is a lot of fun and when I have more time I hope to make more characters from this range. Awww, this guy is so adorable Dionne! 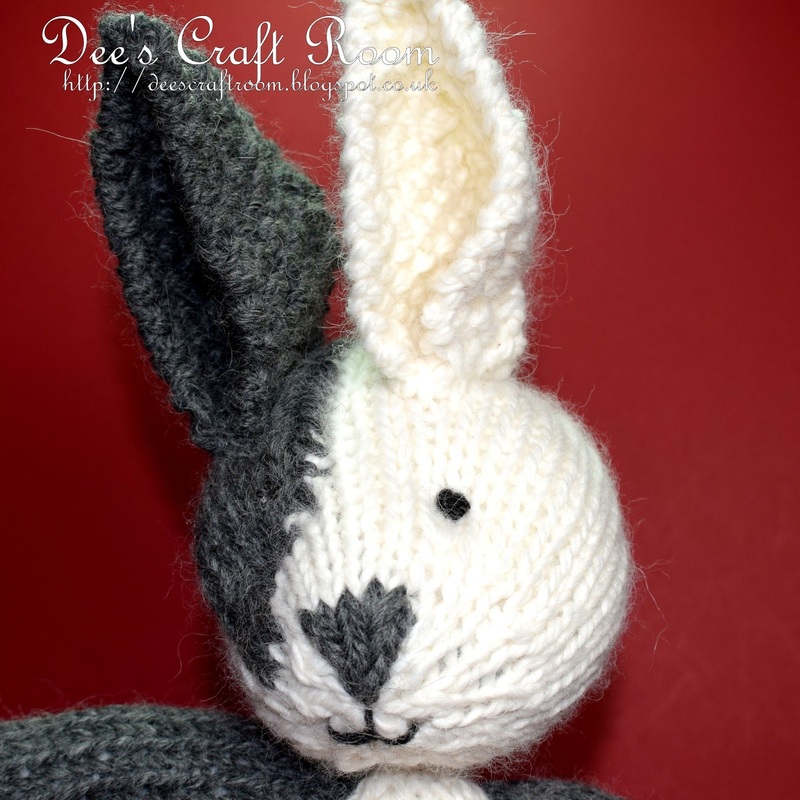 I am so in love with the patch on his eye and the grey ear, just the markings I would want in a real pet bunny! His sweater and jumper are so amazing, love the little buttons. I really want to swish his little tail with my fingers, it looks so soft! lol. Great job! I must apologise, I had not realised that I didn't responded to your comments, and after you went to all of the trouble to leave such lovely thoughts above, it is so rude of me. Sorry! We seem to have skipped spring this year and jumped from winter to summer, with May temperatures breaking records. This past weekend was a Bank Holiday for us and the weather was just stunning, enough to lift everyone's spirits and inspire them to get up and do something. I hope you are enjoying the sunshine and have managed to get out with your camera. Thank you so much Carol, I feel very bad that I have not been keeping up with my commenting but I do not want to miss any of your projects as I adore your work. Expect more comments in the coming days. I am actually feeling very good about things at the moment because I am completely up to date with the blogs I follow .... for 5 minutes. You are always so busy, I really do not know where you get all of your amazing ideas from.